The Netherlands Veterinary Medicines Institute (SDa) was established in order to promote responsible use of veterinary prescription drugs in Dutch animal husbandries. The main priority in this respect is responsible antibiotic use, given the increasing global problem of antibiotic resistance. Dutch livestock farmers and veterinarians are both taking steps to use antibiotics less frequently and only after careful consideration, and aim to reduce the usage of antibiotics to a level below that of 2009. Around that time sales figures of antibiotics for animals in the Netherlands was at its peak. This objective was formulated by the four main Dutch livestock sectors (veal, cattle, pigs and poultry) and other stakeholders, and included in the policy document (only available in Dutch) of the Stuurgroep Antibioticaresistentie Dierhouderij, a steering group on antibiotic resistance in Dutch animal husbandries. This subsequently led to the establishment of the SDa in December 2010. 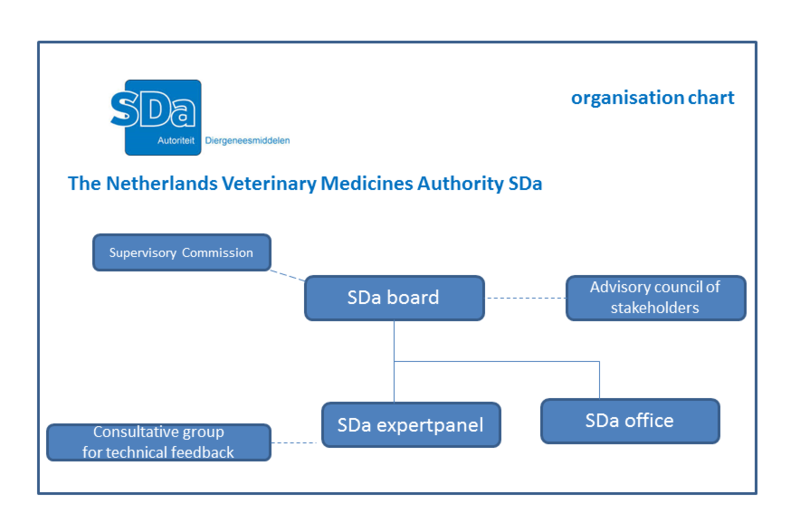 Besides the board and the office (in Utrecht) and an advisory board, formed by representatives of the stakeholder organisations, the SDa organisation includes a group of fully independent experts. The SDa independent expertpanel consists of scientists from human medicine, veterinary science and epidemiology. This panel analyzes antibiotic usage data of livestock farms, veterinary presciption patterns and defines benchmarks regarding both the quantity and the types of therapeutics to be used within each livestock sector. The various quality assurance schemes use these benchmarks as a guide when monitoring livestock farmers’ antibiotic use and veterinarians’ prescription patterns. Read more about the composition of the SDa expert panel. The SDa promotes prudent antibiotic use in animal husbandries. In doing so, it aims to protect public health while still taking the necessary animal welfare considerations into account. To this end, it sets out to make the usage of antibiotics in animal husbandries fully transparent, and to define benchmark indicators that are to serve as target levels in practice. The SDa’s final goal is not merely to realize a reduction in antibiotic use, but rather to restrict the usage of antibiotics in animals in such a way as to minimize the associated public health risks. To this end, the SDa defines specific target values for antibiotic use. To achieve the final goal, animal husbandries should increasingly focus on developing good practices for farm-oriented and chain-oriented animal health management and infection control, as this is the only way to become less dependent on antibiotics. When the SDa was established, it was explicitly stated that scientific research is a precondition for achieving these objectives. Further research into antibiotic use and antibiotic resistance in Dutch animal husbandries could offer a better and deeper understanding of the development of antibiotic resistance. It is also necessary to invest in initiatives and alternatives that may facilitate the intended reduction in antibiotic use or limit the development of resistance. Research focused on diagnostics, animal health monitoring, housing conditions, nutrition, general care and vaccination could be valuable in this respect. The government of the Netherlands has indicated to help support such developments.